Painting a landscape with flowers can produce beautiful results. This whole subject area of painting is very broad. The following gives an overview of it, but for specific teaching tips, please look at the step by step tutorials. Creating a painting of a landscape including flowers can . . .
A great example of this is the painting 'Country Concession' by Paul Chester. Head for google images to view this painting. 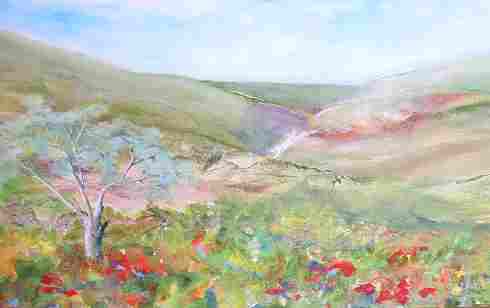 In a similar style to Paul Chester's painting, see how the poppies are suggested with shades of red and oranges. 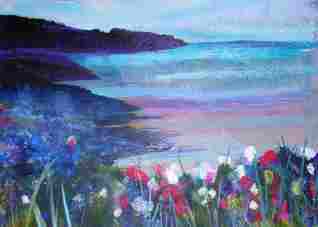 The poppies are not painted as separate flowers but as we view the painting we 'read' poppies in the foreground. A more precise painting of poppies may stop the eye moving around the picture. In contrast, see how the daisies are carefully portrayed. This has been achieved with the use of carefully thought through stages in the painting. 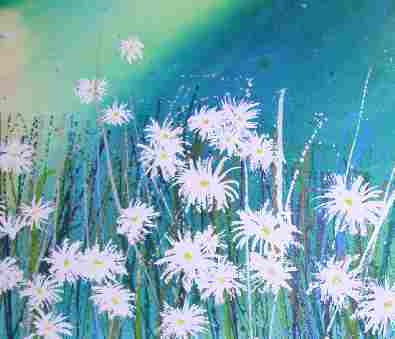 To achieve this style of painting, follow the step by step guide to painting daisies.